End-of-aisle screens can hear what's in your pocket. Imagine you’re walking through the grocery store. The digital displays at the end of each aisle are lit up with ads for the tempting things you’d buy if only you’d browse a little longer. As you walk past, the screen at the end of the soda aisle stops its slow zoom on a perspiring Coke can, cutting to a shot of Coke-owned brand Dasani seltzer pouring clear, refreshing sparkling water into a glass. Wow, you think. I never drink soda but I do love my harmless seltzer. Down the aisle you go. But wait—isn’t that advertising a little too spot-on? This isn’t hypothetical. At 250 grocery stores in the United States, digital Coke-branded “endcaps” (that’s the word for the advertisements on the front of an aisle) are already gathering data from your smartphone and reflecting your preferences back at you via targeted advertising. Chambers sees the Coke screens going up everywhere, not just in groceries. Grocery stores have been using targeted in-store advertising for a while now. But so far, most of that targeting has been confined to shoppers who have downloaded the store’s app. And that’s likely not a huge subset of a store’s customer base. Here’s how it works: Stores can install devices called beacons, which broadcast low-grade Bluetooth signals. The beacon itself doesn’t gather or store your data—it just bleats out its little “I’m here” message. Each beacon has its own special ID. So if you have the Whole Foods app on your phone, and you walk past a beacon inside a Whole Foods store, your phone knows you’re in a Whole Foods. If you have notifications enabled, Whole Foods might then send you a coupon for 30 percent off the beer you splurged on last time you shopped, or 20 percent off a competitor’s beer. Terry Gross did a whole Fresh Air episode on this back in February. It’s well worth a listen. Coke takes that one step further by adding DoubleClick ad-serving technology, analytics, and machine learning to the mix. The company can’t really go the traditional beacon route, because it would have to a) create a really cool app and b) install beacons in pretty much every grocery store, gas station, and movie theatre in America. So it flipped the paradigm: Rather than try to turn your phone into a Coke billboard, which is difficult and requires your consent via the app download, why not just take all that really useful data in your pocket and change its own billboard accordingly? It’s kinda brilliant. 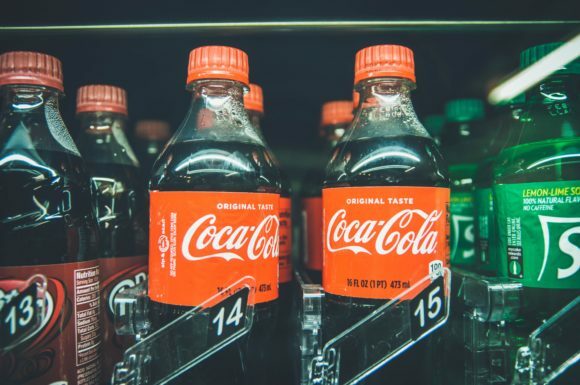 Coca-Cola claims the endcaps pay for themselves in one month through what it calls “category lift,” which basically means the screens entice people to buy more of all soda products, not just Coke and Dasani. And Chambers sees the Coke screens going up everywhere, not just in groceries. The screens “for example can produce a digital menu board for restaurants – from mom-and-pops up to national chains – at about 20 percent of the cost of current providers,” he said in that same article. It’s unclear how much data Coke can actually collect from these screens, but it stands to reason that the company would gain a lot of insight into its customers if it offered low-cost or free ad-equipped digital menu displays to small business owners. (This is a time-honored Coca-Cola tradition: Give new restaurants free branded menu boards, and get free advertising for life.) But in the digital iteration of the deal, that offer may come with an implicit agreement to collect customer data. Chambers told Fortune he hopes to collect more data from the screens in the future. But for now, he’d probably rather you not think about the creep factor inherent in personalized in-store marketing and instead just gaze lovingly at your targeted advertisement. “It takes technology hurdles out of the way and lets brands like Coke get back to engaging consumers with surprise-and-delight experiences,” he explained on the company website. Surprise and delight, indeed.